You know your profile is weak. Or you’re totally new to online dating and have no idea where to begin. I’m glad you’re here! It’s good to know guys like you exist – guys who make an effort and take time to do things right. You need a great profile! After countless men asked me to "write" their profiles for them, I developed a custom process to create profiles for my clients – painlessly, in your own words, with very little writing involved on your part! 1) To start with, I’ll get to know you better with my comprehensive client survey about your life, interests, passions, values, dating frustrations, and relationship hopes and goals. 2) Then, in our 45-minute Skype session, I'll dig a little deeper. I want to find out what makes you different from other guys, the unique things that make you tick, and the special ways you’re a great catch. 3) After our session, I’ll create an outline and a rough draft for your whole profile. This will be in a detailed list and/or paragraph form based on what I’ve learned about your personality, passions, lifestyle, and the girl you’re looking for. 4) My draft makes your job easy. All you’ll need to do is connect the dots where I've noted for you. 5) After you’ve revised your profile, I’ll review it for you with two priorities in mind: 1) who you are, and 2) what she sees. 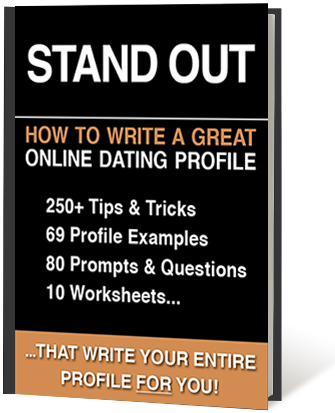 I’ll also help you avoid the usual profile mistakes that other guys make. 6) Then, I’ll walk you through a round of revisions. It’s our goal to make sure we’re highlighting your strengths and showing your personality to your best advantage. 7) When you’re ready to choose profile pictures, I’ll help with that, too! Great profile pictures are only part of the game. It’s also important that your pictures look like you – and also seem happy, interesting, and non-threatening. We’ll work together until we’ve got a great starting lineup! I'll be with you the whole way. When we’re done, you’ll have a great profile and your best profile pictures. You’ll feel confident you’re putting your best self out there – but also your real self. Because that’s who’s going to get the girl! BONUS: Get a Free Message Review! Check back in with me after you’ve had time to look around on your preferred dating site and sent a few messages. We’ll talk about how things are working out, and I’ll review some of your best messages and conversations. Then, we’ll work together from there to make sure you’re writing great messages…and on your way to finding a great girl. Want to work in-person or by Skype/phone? For Working In Person, What Major Cities Are You Near?